In this blog post, Senior Commissioning Editor for Physics and Astronomy, Vince Higgs, explains what makes Conquering the Physics GRE 3rd Edition, 2018 stand out as an exciting new acquisition for Cambridge University Press. The Physics GRE is an exam required by most U.S. graduate schools’ physics departments and forms part of their evaluation for selecting students for their Ph.D. programmes. It is a timed, multiple-choice 100-question test covering all the main topics of a typical undergraduate physics degree. The test’s unique format differs from the traditional long-question exams that students will be used to, so it requires some specific preparation and practice in order for students to achieve their best results. The raw test results are scaled, so that rather than a simple percentage score, students receive a test score that indicates where they rank among the pool of candidates who also took the test. Not having come through the U.S. university system myself, this was all new to me. My first contact with this project and the Physics GRE came about at the American Physical Society’s April meeting in 2016, where I met with author Yoni Kahn. He and Adam Anderson had been students at MIT and found, to their surprise, that the existing resources for GRE preparation were woefully inadequate, in that they failed to take the test’s short-question format fully into account and none of them provided full-length practice tests. So when they were graduate students, they decided to write and publish “Conquering the Physics GRE” themselves. It quickly gained a reputation for being the go-to resource for physics students seeking entry to U.S. graduate physics programmes. I quickly realised how impressive a feat these two young authors have achieved in their book: they briefly review all the main topics the exam covers, with reference to the types of questions and problems students are likely to encounter. They also provide an incredibly useful chapter on ‘tips and tricks’ that will help people with their exam strategy, for example how to use your physics knowledge to narrow down the possible answers as quickly as possible. I am honoured that Cambridge University Press were given the opportunity to publish the Third Edition of “Conquering the Physics GRE”. I hope that this book will help motivated physics students everywhere achieve their full potential and ambitions to study physics within the U.S. Here’s a short extract from the book’s Preface that explains more about what the book does and, importantly, what it does not. Studying for the GRE can be overwhelming! This book is long because it contains all the information you need to ace the exam, but not every student needs to study every chapter in equal detail. Here are some suggestions for how to use this book. Only numbered equations are worth remembering. The Physics GRE is a test of outside knowledge, so some memorization is inevitable. However, we have made a concerted effort to separate equations that are only used in specific worked examples from equations that are worth remembering for the test. The only equations worth remembering are given equation numbers and are included in the Equation Index at the back of the book along with the page number where they appear; anything else you can safely forget for test day. This is still quite a long list, so rather than memorize each equation, check out Chapter 9 for suggestions on how to reduce your memorization workload by deriving more complex equations from more basic ones. Use these sample exams as diagnostics. ETS has released precious few actual GREs, and only the most recent (from 2001 and 2008) are representative of the current content of the test. We strongly suggest you leave the ETS exams until shortly before the actual test, where you can take them under simulated test-taking conditions. To start your studying, consider taking one of the sample exams provided in this book as a diagnostic, and note which areas you need to review the most. You can then focus on the review chapters covering these particular subject areas. Once you feel you’ve sufficiently filled in the gaps in your knowledge of undergraduate physics, you can take another sample exam and track your improvement, leaving the last exam for extra practice a week or two before the test, should you need it. Because we don’t have access to ETS’s proprietary scoring formula, we do not attempt to offer any conversion between raw score and scaled score (200–990) for our sample exams. Guessing at a formula would be extremely misleading at best, so use your score on our exams only as an estimate, but by all means use the ETS-provided conversion charts when taking the ETS exams. Don’t try to learn all of undergraduate physics from our book. We have tailored the length and content of each of our review chapters to roughly follow the proportions of the GRE: 20% classical mechanics, 18% electromagnetism, 9% optics and waves, 10% thermodynamics and statistical mechanics, 22% quantum mechanics and atomic physics, 6% relativity, 6% laboratory methods, and 9% specialized topics. Our expositions of standard first- and second-year undergraduate topics are extremely brief or nonexistent, and we have given slightly more weight to more unfamiliar topics you’re unlikely to find in together in a single book, in order to make this book self-contained. If you find yourself totally mystified by a topic or completely unfamiliar with a formula, look it up in a more detailed reference! We’ve provided a list of suggested resources below. Treat the end-of-chapter or end-of-section problems as subject practice rather than actual exam questions. While our review problems follow the GRE multiple-choice format and don’t require calculators, we don’t intend them to exactly replicate GRE questions in style and difficulty: that’s the purpose of the sample exams. Rather, the problems are there to highlight important problem types or calculational shortcuts, and as a result may feature solutions with more steps than you would see on test day. We recommend you work these problems as you’re studying a particular chapter, but don’t feel the need to keep to the GRE time limit of under two minutes per question. Last, a comment on the structure of this book. We realize that there are many, many equations to learn that are relevant for GRE-style physics problems. To keep the amount you feel you have to memorize to a minimum, we only assign equation numbers to equations we feel are important to remember – everything else you can safely ignore. (This is not to say that you should memorize every single numbered equation – Chapter 9 contains useful advice for what to memorize and what to derive.) Also, while most of the review chapters review material in roughly the order it was presented when you first learned it, Chapter 1 is structured very differently. We assume that you still remember many of the basic facts of classical mechanics from your freshman year introductory physics course, and so we focus our attention on problem types that are standard on the GRE, rather than on specific subtopics. We hope you will find this approach useful. 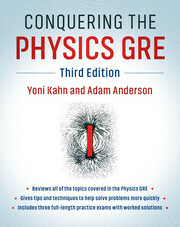 Since Conquering the Physics GRE was first published, both authors have completed graduate school and gone on to careers in academia: Yoni as a theoretical particle physicist, and Adam as an observational cosmologist. If this kind of career path is what you’re hoping for, this is the book for you! Conquering the Physics GRE remains the only comprehensive reference book specifically tailored to the topics on ETS’s Physics GRE, and indeed we often refer to this book as a quick reference for key undergraduate physics topics. The revised third edition, published by Cambridge University Press, makes numerous changes in response to comments from students and faculty who have used this book for GRE preparation. Most importantly, the three full-length sample exams have been completely reworked so that the difficulty and types of questions better match the current content of the exam. We have added an equation index, a subject index, and a problems index so you can easily look up particular terms or concepts that appear on practice problems and solutions as well as in the review material. Finally, we have made many improvements to the review chapters, including additional figures, diagrams, and practice problems; an updated Nobel Prize section; and brand-new review problems for the Tips and Tricks chapter. We hope that these changes make this book a better reference not only for the GRE but for your bookshelf in your future physics career.